Princess -- 8 year old standard grey female chinchilla -- dob March 2011 -- SPONSORED! -- fostered in Chicago, IL -- SALE!! NOW $65!! 5 year old black velvet female chinchilla -- needs home with no small children -- dob 3/24/2014 -- SPONSORED! -- fostered in River Forest, IL -- SALE!! NOW $75!! 5 month old pink white female chinchilla -- dob 11/6/18 -- SALE!! NOW $175!! We have a pink white female chinchilla who’s looking for her new home. She came to NWI just a bit ago, and is now ready to leave and go to a family of her own. She was born around 11/6/18, making her right around 5 months old. Her color is called pink white, which is typically an overall white body color, though pink whites can also have some beige coloration. This girl is pretty much solid white though, she just has a little beige shading on her head, face, and the base of her tail. This girl is on the calmer said. She is relatively easy to scoop up into your arms. When you’re holding her, she can be curious and wants to check things out, but once she settles down, she is super sweet and does really well with being handled and petted. Super sweet girl. Doesn’t bite. She would make a great “first chinchilla” for someone who’s never had one before. This furball has a sponsor!! Erol A. is sponsoring her until 4/5/19!! If you are interested in, or curious about sponsoring a chinchilla, contact us for more info! Sponsoring is available as an option in the webstore, and you can choose which chinchilla you'd like to sponsor! Please note: this chinchilla is currently living in a foster home in River Forest, IL. She can be adopted directly from the foster home, or from the rescue in Hammond. Please allow for a few days for necessary arrangements to be made. Thanks for your understanding! We have a black velvet female chinchilla who’s looking for her new home. She came to NWI not long ago, and is now looking for a home of her own! We estimate that she was born around 3/25/14, which makes her right around 5 years old now – great time to bring her home! This chinchilla’s color is called black velvet, which is a black color over the chinchilla’s back, with a nice white belly. This furball is a sweet girl. She doesn’t have the utmost patience in the world for people poking her though. Handling and petting is perfectly fine with her, but having mini little hands stuck through her cage bars poking her all day is not for her, and she is not a fan. She’s never bitten, but she will bark and express her displeasure… and let’s be honest, there’s no reason to make her unhappy. We want her to be happy and thrilled with life! So, she needs to go to a home with either all adults, or where the kids are older teenagers. No little kids, for her sanity. Now that that’s out of the way, onto her personality – she’s actually rather sweet, and is relatively easy to pick up. She can be a bit squirmy at times, and she sometimes does take a bit to settle down into your arms, but once she does settle down, she’s very sweet and will chill with you for short periods of time. Sweet girl. Doesn’t bite. She would make a great “first chinchilla” for an adult-only or adult-with-older-children home, where the kids understand not to poke her. Fill Your Prescription Sale!! Adopt me now for $75!! 8 Year Old Standard Grey Female Chinchilla -- "Princess"
Princess is currently being sponsored by Taryn S. until 4/27! What a lucky girl! If you're curious about or interested in sponsoring a chinchilla, contact us! Sponsoring is an option in the webstore, and you can even choose which chinchilla you'd like to sponsor! We have a standard grey female chinchilla that is looking for her new home. Her name is Princess. She came to NWI a bit ago, and we have that she was born around March 2011, which makes her about 8 years old. Please note: Princess is currently living at a foster home in Chicago, IL. She can be adopted out directly through the foster home, or she can be brought back to the rescue in Hammond for an adoption as well. Please allow time to make arrangements for any needed transport. Thanks for your understanding! Princess’s color is called standard grey, which is the classic color in chinchillas – a greyish color over his back, with a white belly. 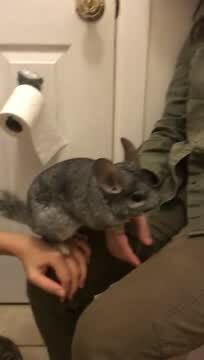 Princess was dropped off with another chinchilla, after being purchased last Christmas as a Christmas present for two young children. Neither chinchilla was super sociable, and so the kids lost interest and they were surrendered to our rescue. The other chinchilla has already found a home, but Princess is still here and still looking! Princess is an escape artist extraordinaire. She loves to come up to the front of the cage, which can make you think she’s outgoing and fearless (which she is! )… though also she wants to go out and explore! If you’re not careful, she’ll make her way past you and go exploring! Princess isn’t a huge fan of snuggling, though she loves playtime! She also loves her wheel and loves to run around when she can, so she would do great in a home that would like to do playtime! She is a quick one though, and getting her back in the cage after playtime might be a fun time and hey, a workout for you! Princess has never bitten. So you see, she’s a nice mix of fun and energetic chin! Fill Your Prescription Sale!! Adopt me now for $65! !